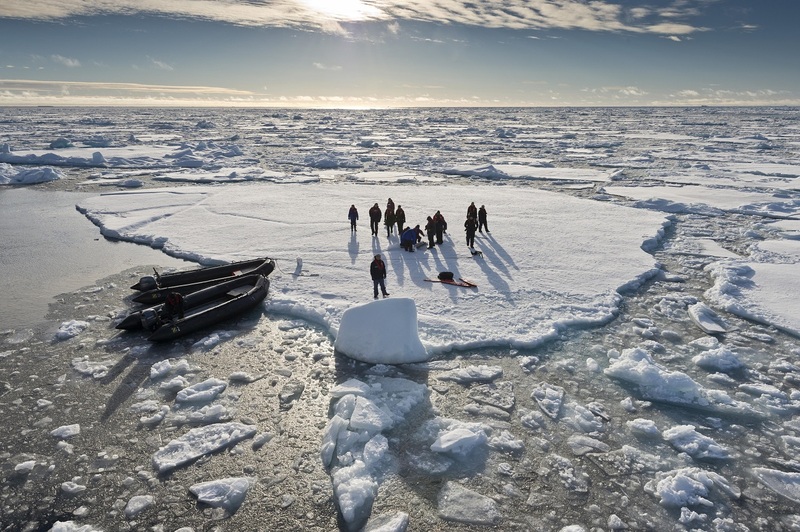 Tourists taken in inflatable boats onto an ice floe, pack ice, Spitsbergen Island, Svalbard Archipelago. The Russian government would like to welcome a larger number of tourist groups to the Novaya Zemlya and Franz Josef Land archipelagoes. However, tours that involve helicopter rides and a voyage on a nuclear-powered icebreaker are not within the reach of all tourists. Russia is preparing to implement large-scale projects in the Arctic to attract domestic and international tourists. Over the next few years the Russian government plans to create tourist facilities and a visitor center in the archipelagos of Franz Josef Land and Novaya Zemlya, where the Russian Arctic National Park is situated. The Russian government estimates these measures to cost 700 million rubles ($12 million), Environment Minister Sergey Donskoy told reporters on May 11. The park encompasses 21.75 million acres, and is home to many endangered species such as the polar bear, Atlantic walrus, bowhead whale, Novaya Zemlya reindeer, and white-beaked dolphin. Independent travellers are not allowed to visit the Russian Arctic National Park. Tourists are only allowed in groups on a tour that is pre-approved by park’s management. A visit to park as well as the North Pole can cost up to $45,000. For that price a tourist starts his journey on a nuclear-powered icebreaker from Murmansk, the largest ice-free port beyond the polar circle, and heads towards the North Pole. At the North Pole, tourists can walk on the ice, enjoy barbecues and even swim, if conditions permit. On the way back, the icebreaker visits the islands of the Russian Arctic National Park, where tourists can admire the picturesque landscapes and glaciers, and get a glimpse of the local birds, walruses and polar bears. The tours last from 11 to 15 days. Russia is seriously interested in the development of tourism in the Arctic. At the moment, just a few of the islands are open for tourists in the Novaya Zemlya and the Franz Josef Land archipelagos. According to the Russian Arctic National Park’s official portal, almost 1,000 tourists visit the park every year. The largest numbers come from China (almost 28 percent in 2016) and Germany (17 percent). Only five percent of the visitors are from Russia. The park would like to have at least a fivefold increase in visitors, its acting director Alexander Kirillov told TASS in an interview. Tourists usually reach the Russian Arctic by icebreakers, but the park may soon be accessible by flight. A military airstrip, which can be used year-round, was recently commissioned on Franz Josef Land. The strip may also be used by civilian aircraft, which would help reduce the cost of tours, Kirillov added. It is the high cost of tours that mainly stops the growth of the tourism to the park. Tours to Lake Baikal, the world’s deepest lake and biggest source of freshwater, cost less than a fifth of what it costs to visit the Arctic. In addition, after cleaning the Arctic (removal of petroleum barrels products and other metal scraps) Russia plans to throw open an observatory named after Ernst Krenkel on the island of Hayes, Franz Josef Land to tourists. The observatory had been operating from 1957 to 2004. About 200 people lived in a village near the observatory. It even hosted the northernmost kindergarten in Russia. In 2015, a special checkpoint for foreign passenger ships was created in the Franz Josef Land archipelago, which helped reduce the route of cruise ships from Svalbard to Franz Josef Land by three days. The opening of the checkpoint also reduced the cost of these trips. The time factor is important, as there is a short tourist season in the Arctic, Environment Minister Donskoy told Ogonyok magazine in an interview. Despite the fact that Svalbard belongs to Norway, Russia is undertaking economic activities on the archipelago and owns three settlements in Spitsbergen, the largest and only permanently inhabited island on the archipelago. A visitor to Svalbard, in addition to enjoying the beauty of the Arctic nature, can plunge into the frozen Soviet past. In the former mining town of Pyramiden, abandoned in 1998, a tourist can get a glimpse of the bygone Soviet era, since the town has retained the full flavor of the Soviet Union. The local museum, library, palace of culture and sports center remain in the same form in which they existed 40 years ago. Pyramiden also has the world's northernmost statue of Lenin. The price of tours to the Svalbard archipelago is around $20,000 for a 5-8 day tour. Another tourist attraction is Barneo, an annual drifting ice floe camp that is set up by the Russian Geographical Society. This is the main base for ground tours on the way to the North Pole. A research camp, Barneo is open for tourists. Barneo exists for just one and a half months a year – from mid-March to late April. During this period, the camp witnesses Arctic polar days, but the sun is still not able to melt the ice. Tourists from Svalbard to Barneo fly on an An-74, which is the only large cargo aircraft in the world that can land on an ice floe. From Barneo tourists take a helicopter to the North Pole for half an hour. The distance from the camp to the North Pole is just 100 kilometers. In the heart of Barneo tourists enjoy different activities such as snowmobiling, dog sledding, and Arctic diving. However, visiting Barneo is not a cheap by any means. A two-night stay in the camp costs about $20,000.